Alright everyone, welcome to another exciting episode of The Creative Marketing Zone Podcast! I am your host and chief creative officer, Eric Koch (rhymes with watch) and this is the weekly show on all things creative to help you get into creative marketing zone for your business, or even for your personal life. Today, I am super pumped to bring on Kevin Koskella, Co-Founder of Work Hero. Work Hero specializes in helping internet professionals by accomplishing their design and technical tasks so they can focus on the work they do best. Now Work Hero is not a marketing agency, nor do they replace the need for Virtual Assistants for everything. Their team focuses on the annoying and technical tasks that internet business people should not have to deal with, and they keep it at a flat, affordable monthly rate for their service, which includes unlimited design tasks. Instead of watching hours and hours of YouTube videos trying to figure everything out or having to go down the frustrating route of hiring multiple freelancers, Work Hero handles every task for you in one place. WordPress updates, HTML coding, email automation, platform integration, graphic design, you name it they can pretty much handle it for you. They support well-known platforms such as WordPress, Leadpages, Click Funnels, Infusionsoft, Kajabi, ActiveCampaign and more. 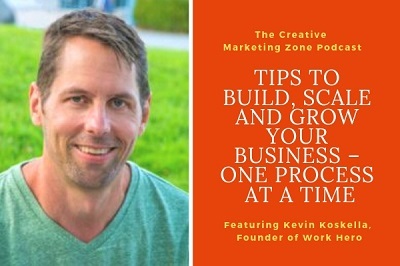 I wanted to bring Kevin on the show to discuss how he has built, scaled and grew his business one process at a time, and some of the results clients have seen by incorporating these same processes back into their business. As you know, running a business is no easy feat, especially if you are starting out by bootstrapping – trust me, I know what this is all about. Scalability is a real thing, and there just isn’t enough time in the day to do everything we would like or want to do. This is where outsourcing comes into play, and believe me, there are tons of things in our businesses that can be outsourced in which we may not have thought about. This is where Work Hero comes into play. Kevin and I have a fun conversation about this on today’s show, and I was able to learn a lot, which means you will as well. Exciting stuff! I have been doing this show for over a year and a half now and it is such a pleasure of mine to be able to connect with awesome folks, like Kevin, who come on and share their tips – for free! I get to learn with you along this journey and believe me, this journey will continue! Either I feel a little more hopped up than usual today from the coffee I am drinking, or perhaps I am feeling excited because tomorrow – February 7th is my birthday guys! I am excited because I actually am going to celebrate for once. In the past, I never really paid much attention to my birthday except for the fact that I do enjoy watching all three Back to the Future films on this day with my now 14-year-old son – hopefully he is not tired of this. But this year I am going to enjoy some time with friends and family and celebrate. This year is a year of rebuilding for me on many levels, and this is something I wrote down for this year, which was to actually celebrate this special day. I deserve it, right? Off tangent, I know, sometimes I can be, but speaking of support from everyone tuning in - if you can do me a HUGE favor if you haven’t already done so, please smash that subscribe button on your favorite podcast listening player to be alerted of new episodes each week. And if you are tuning into The Creative Marketing Zone Podcast on iTunes, then do me a solid and leave me a review! If you are on your mobile phone tuning into this podcast or have your mobile phone nearby, then simply text the code word “strategy” to 31996 right now and I will send you the link to schedule your free creative marketing strategy call with me. I have just three spots remaining to hop on a call with me so definitely take advantage of this cool free offer. Again, simply text the code word “strategy” to 31996 to get the link to set up the free call with me. I look forward to connecting with you and learning more about your business! Alright, guys, we have an interview to conduct, don’t we? So, without further ado, let’s welcome Kevin to the show! Processes business owners should implement in their business when they are either first starting out or are needing to elevate their brand to the next level. Do yourself a huge favor and go to www.useworkhero.com to learn more about how you can get connected with a “hero” for your business to take on those annoying tasks so you can focus on more productive stuff for your business today. What’s super cool is that when you go to the www.useworkhero.com website, Kevin has a good video up on the home page walking you through how this all works. And you also get a free seven (7) day trial (risk-free) which includes unlimited tasks to work on. You will actually come out ahead and save a ton using Kevin’s system at Work Hero. Alright, guys, that is all I have for you today. Thank you so much for tuning in. Be sure to join us again next week as we will continue on with some more awesome creative marketing ninja tips for your business. And again, if you or someone you know needs some creative marketing assistance to take your coaching, consulting or even marketing agency to the next level, then text the code word “strategy” to 31996 from your mobile phone to set up your free strategy call with me today.